Your dog may be adorable. Your cat may be cute. But can they compete with a glowing group of thousands of tiny pets? 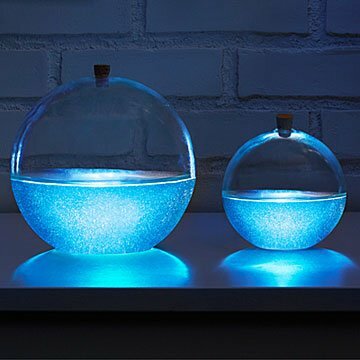 Bioluminescent plankton called dinoflaggelates illuminate this spherical environment when you gently swirl it. Just let them bask in indirect light during the day and they'll treat you to a soft blue light show at night. Quiet, compact, and easy to care for, the glass sphere lets you hold one of nature's most magical phenomena in the palm of your hand. It makes a unique interactive aquarium, and an awe-inspiring work of living art that won't bite the hand that feeds it. Components made in China and the USA. Please note: this item must be opened immediately and should not be left exposed to extreme temperatures. It will only light up at night, and only once it's adjusted to your geographical zone (which may take a few weeks). Small: 4" H x 4" diam. Large: 6" H x 6" diam. Open immediately and provide moderate lighting (indirect sunlight, artificial room light is ideal). Keep sphere out of direct sunlight or intense light conditions. The temperature can range from 63F to 77F (17C- 25C) without significant harm. A sudden change in temperature is not recommended. Keep a cool dry place. Expires in 6 months from purchase. May be kept in refrigerator. Be sure to bring to room temp before adding to sphere. Click here to see the Bioluminescent Aquarium Instructions. Click here to see the Bioluminescent Aquarium Troubleshooting Tips. Click here to see the Bioluminescent Aquarium Care. I bought them as a gift for my husband and we both were excited to receive them. I read reviews that sometimes it takes a while for them to start glowing, but we have now waited a month and a half and still nothing. I'm not sure if it was to cold outside when they delivered them or if they just never work at all.. I feel like it is just an expensive sphere with water in it..... Something this awesome was too good to be true and I would NOT recommend this product. Just beautiful. If you've ever wanted to hold some magic in your hand, this is your chance. The product itself is wonderful. I would recommend it for anybody who's interested in this sort of stuff. The negative reviews are mostly due to the fault of the buyer and the lack of research on their part. Whether it just be impatience or improper care, the failure of the product is due to the failure of the customer here. As stated by the providers it will take a few days for the plankton to adjust to their new environment, so if one doesn't see results immediately, just wait. The glow is soft and ambient and I love how the plankton react at the smallest point of disturbance; even placing a water bottle or soldering something on the same surface as them will yield a reaction. They do only emit light for a minute or so each night when shaken, so it's always a little pocket of joy to end the day on. I'll give them an A for marketing but for product choice I give them an F. As somebody who has never seen this in person and not too familiar with it I thought it would be cool to have. I didn't expect the algae to glow all night but I did think they'll glow for a while. The picture and the description is misleading. It has to be dark, dark for the glow to be seen and it stop as soon as the agitation stops. It's a great vacation idea to see in real life and great for pictures but as a gift or a as a desk ornate like I bought it for it's just expense blue water. The light does give it a nice reflection so I'm going to find another container to put it in but yeah, it's not worth the money. I gave this to my brother for his birthday. He said he thought it was really cool. But then told me you have to go into the bathroom, turn off the light, and spin it around to get it to glow. Not really what i was expecting based on the picture. This was a horrific failure of a gift for my budding marine biologist. They are non refundable and didn't work in the slightest bit. We have some very expensive blue water. this never ever even lit up for us, I was so excited when this came and I opened it right away and set it up and that night nothing and nothing ever since, we were never inform of having to "feed" anything, either way, save your money!! It worked after the first night and had no trouble every other night. However, after youbswirl it once or twice, the plankton don't light up again until they've settled for a while, so it's quick and not long lasting. I've gone swimming in the bioluminescent bay in Vieques and it's AMAZING! This is a great reminder of that. My brother bought me this as a Christmas gift. And it never really worked. Very disappointed. My room temperature is always around 68-74. No direct sunlight. Due to the delicate nature of the dinoflaggelates, the living organisms that make the Bioluminescent Mini Aquarium glow, someone must be present to receive the package at the time of delivery.